Buddhist Spirituality is a global social movement that for 2600 years has been warning about the damage that drugs cause in the minds of the peoples. However, governments of capitalist civilization are often accomplices of the advance of drug trafficking. For this reason, the Maitriyana reiterates again the gravity involved in the plague of drugs, because it sows greed, hatred and delusion in human consciousness. To cope with this evil that causes suffering and death, the spiritual master teaches that the whole society must take courage to keep Mindfulness and Purified Consciousness. Through this ethical message the Free and Enlightened Being (Arhat-Bodhisattva) makes a call to the Socially Engaged Spirituality, firmly adhering the pacifist message as an adequate means to fight against drug trafficking and organized crime. Indeed, the proliferation of drugs addiction within peoples is a problem that is so serious and vast that only the Ethics of Detachment seems to be its Cure (Nirvana), which is why there is an urgent need for a spiritual conversion on the part of the society. Precisely the contemplative practice allows focusing consciousness, focusing attention around a Purpose (Dharma) of life, so it is helpful facing dispersion and superficiality that generate drugs and mass media. The complexity of the problem of drug trafficking can be banished only through the comprehensive transformation of consciousness, training it to not resort to evasion of suffering which is certainly drug consumption. The Buddhist Spirituality argues that drug addiction is a symptom of existential dissatisfaction (dukkha) or absence of Sense of Purpose (Dharma) in the world, so that the individual flees from the present to surrender to an existence of illusion. The growth of drug trafficking and addiction to drugs evidence that people live more and more in a fictional world, lacking of ethical goals and spiritual hopes. When Maitriyana analyzes drug trafficking basically understands it as the globalization of intake of mental intoxicants. However, the libertarian meditation allows perceiving the profound degree to which drug trafficking is supported and intertwined with governments and private companies. Since the interests of the Free and Enlightened Beings (Arhats-Bodhisattvas) are deeply transnational, the Buddhist Spirituality displays a pacifist, fair, cultured and harmonic force into a process that neutralizes the suffering generated by the drug scourge within society. In this context, the spiritual master denounces that drug trafficking and organized crime grow with the complicity of the corporate and governmental sectors, which benefit enormously by keeping the population with a damaged and sick conscience. This is because Mindfulness and Purified Consciousness are a threat to the survival of materialistic Power, because they are the embodiment of the values of Liberty, Equality and Fraternity. The presence and transmission of Maitriyana is then that of a counterpower that denounces governments and companies which are complicit in evils such as arms trafficking, corruption, prostitution, covering-up and drug trafficking, which attack the physical and ethical existence of human beings. The Free and Enlightened Being (Arhat-Bodhisattva) makes a global call to the spiritual conversion of all peoples, while his fundamental desire is that all humankind becomes promoter of Human Rights and abandons the culture of selfishness, dualism and consumerism. In this way, the spiritual master is the transmitter of an appropriate scale of values that lead to true happiness, plenitude and Awakening (Bodhi) of Being. Here, the self-realization of human being appears identified to the interexistence with the others. This proposal that society abandons drugs and attains peak knowledge (Satori) is the product of paradoxical dialectical logic of Buddhist Spirituality, which enlightens every nook and cranny of the world through compassionate wisdom (prajna-karuna). Thus the Maitriyana copes with the indifference and conformism, making the supreme effort to convey the Cure (Nirvana) from the evils that sicken the peoples. This is because the causes of drug trafficking and organized crime are nothing less than the global expansion of the false values of selfishness, dualism and consumerism that are part of the very structure of capitalist civilization. TheEthics of the Middle Way allows understanding that drug trafficking and organized crime are at the very core of unbridled capitalism and authoritarian communism, since both systems are materialistic and idolaters of attachment to money and Power. Since attachment is at the root of all evils, the Buddhist Spirituality teaches a lifestyle based on Detachment, denouncing that drugs and money never manage to fill existential emptiness (Sunya) of the human being. This means that the fight against drugs trafficking cannot be won by the current security systems, based on violence and punishment, but rather it can just be properly won by the profound Planetary Cultural Revolution proposed by Maitriyana, by having the duty to protect and develop the spiritual legacies of the peoples which are threatened by drug trafficking and organized crime. The Free and Enlightened Being (Arhat-Bodhisattva) then becomes the maximum referent of a genuine awakened and evolved society that has overcome the materialistic ambitions of the past, by educating humanity in the higher and amplified state of consciousness (H-ASC). Therefore, drug trafficking can only be overcome if people perform a great effort to ethically transform their education systems, in order to teach the coming generations how important is to live in the Way of the Law or Purpose (Dharma). Indeed, peace, social justice, advanced education and ecology generate the new scenario of progress that is the libertarian socialist civilization. This hope or horizon is the true antidote to the drug trade, because only through discourage consumption is that production will be destroyed, just as with any other economic activity. This means that if people are inwardly transformed by means of contemplative practice then they will cease to resort to drugs to escape from reality. The presence of ethical and spiritual exemplariness is what develops the existence of society, advocating for the welfare of all beings. 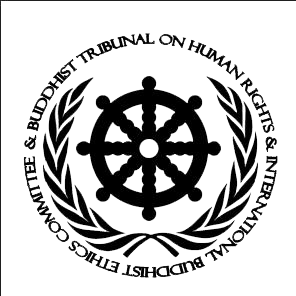 Buddhist Spirituality progressively installs a new kind of Law that allows resolving conflicts adequately, by abandoning violence and punishment to deploy the power of ethics and reconciliation. When recognizing drug trafficking as a global problem, the spiritual masters assume the responsibility and commitment to fight peacefully against this evil, by protecting the peoples who are helpless in the face of organized crime. In this sense, the Maitriyana denounces companies and governments that are complicit in the corrupt and criminal Power, claiming the need to implement comprehensive policies that are correct and appropriate to define and affirm the process of Liberation and Awakening (Bodhi) of the whole humanity, which will only happen if it is achieved before the Evanescence (Nirvana) of drug trafficking. The Free and Enlightened Being (Arhat-Bodhisattva) risks his life to assume his mission in the world, since his struggle seeks to create a Pure Earth or Kingdom of Righteousness. All the peoples should participate in this supreme task, by committing themselves with the care of others and nature, because otherwise humanity will be self-destroyed. Buddhist Spirituality is always close to those who suffer, to whom it transmits a life practice based on friendship and mercy, which are attitudes of spiritual conversion that heal the very fabric of society, by placing the individual closer to the heart of the great spiritual masters of history. It is time for people to stop doing evil, do good and purify the mind.